What is LEGO® SERIOUS PLAY® and how can LSP help you? 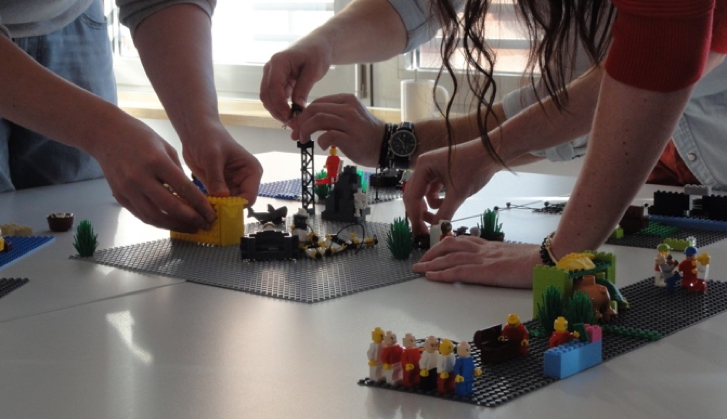 LEGO® SERIOUS PLAY® (LSP) helps to create new ideas, improve communication and speed up problem solving in companies, teams and organizations. During the facilitated process participants build personal idea prototypes with Lego materials to answer complex problems. Individual models are combined to create a shared notion of a solution. LSP is an interactive tool for problem solving. LSP is specifically designed to solve complex problems in the business world and to communicate more easily in teams. The facilitated process allows the participants to build models and use them as metaphors. This allows organizations to understand complex relationships and to analyze scenarios. A typical LSP session is with a team of 6 to 12 people. While multiple teams can work in parallel. The iterative process follows 4 core steps in each round. Complexity and value increase from round to round. A LSP session can range from 60 minutes to 2 days. Sometimes it is hard to come up with ideas on how to solve a problem. Sometimes it is hard to find the right words to explain one’s thoughts. Sometimes it is hard to explain your thoughts, ideas and desires to others only with speech. LSP is a way that helps you with all this: Come up with new ideas, gain clarity about your thoughts and desires, and communicate them to others. There a two basic steps when working with LSP. In the first step, you are using Lego bricks to build a model of your thoughts. While having some Lego bricks in your hands, your brain automatically works faster, and thoughts become clearer. There is no manual or blueprint on how to build. But there is a guide who will help you to ask yourself the right questions. You then answer them by building something with the Lego bricks. And you are not doing this alone, but in a group. In the second step, you tell others a story about the model you just built. This helps you to explain your ideas and desires, so others can understand them easier. LSP can help to clarify misunderstandings with your family and friends. It can also be used to come up with a common understanding of what your next family holiday should be like. LSP is used a lot in companies to improve the way they work, create ideas for new products and make their customers happier. The 4 core steps of LSP in each round are: (1) Challenge, (2) Building, (3) Sharing and (4) Reflection. The facilitator poses a complex question. This is the challenge participants are faced with. A question is considered complex when there are no clear answers, right or wrong. But different feelings, knowledge and experience can lead to multiple answers. Typically, we ask participants about their personal motivation, their superpowers, a vision for a better future, their ideas about new products, or a perfect business strategy. Our objective is to combine individual ideas to a shared solution. Primarily we must extract individual ideas from people’s minds (especially their subconsciousness). Participants answer the question and meet the challenge by building a personal model. There’s no blueprint or manual on how to build. But there is a special connection between the hands and the brain (“hello neuroscientists!”) that helps to extract existing ideas from one’s mind and create new ideas by tapping into the subconsciousness. The bricks are just a tool to enable participants to come up with and build ideas. Usually we give a certain amount of time to build, ranging from 1 to about 20 minutes (timeboxing). Decisions made with time pressure are at least 99 % as good as without any time constraint, sometimes even better, but foremost people are happier if they made quicker decisions. After each participant has built his or her individual model, we ask them to tell a story about their model. The story should answer the initial question. The answer to the complex question posed is already present in the model but participants need to explain and paraphrase the model they’ve just built. Not until they have told their story, they do not know for sure how the model will answer the question. You may have heard about the fact that people think while talking. We employ the same mechanism. Sharing also allows other participants to understand the model, gain new insights, see the problem from a different perspective, and combine a potential solution with their own ideas. As LSP is a facilitated process this step is usually the most demanding for the facilitator. While the facilitator predominantly just asks a question in step 1, motivates and helps in step 2, and listens and takes notes in step 3, now it’s time to show why he is usually highly paid. Preparing the right question is a lot of effort, though. The facilitator does not have to be an expert in the respective industry, but he needs more than just common knowledge. It is always a good start to summarize the individual stories. The wrap-up should only compress, recite and paraphrase. But not come up with a potential compromise. This will be the job of the team in another round. From a bird’s eye view, the facilitator highlights similarities, conflicts and queerness. It is also a good idea to ask participants about their feelings after each round to check about their motivation, any obstacles, or potential reactance. He can also reflect about the process and answer questions on LSP in general. A workshop that uses the LSP method is complete when there is a shared notion of the best possible solution. Participants combine individual models to a shared model. The iterative process guarantees that the ideal solution is found, not only the lowest common denominator. All participants are involved and engaged. LSP – as with most innovation and creativity techniques – works best with an interdisciplinary and heterogenous team. The problem is viewed from different perspectives and individual experiences and knowledge complement to the solution. Because of 100 % involvement we create 100 % ownership of each participant with the result. Participants can build additional models to enrich the solution in order to create a network (or system) of ideas and entities. When relationships are identified, scenarios can be simulated to check if the solution is robust or needs further optimization. The resulting Lego model or system of models is a visual representation of the solution. It is recommended to condense the key learnings or key aspects of the solution with 3 to 5 simple words or bullet points. Sometimes the Lego models are not disassembled after the workshop but remain in a war room over weeks, months or even years during implementation. The model can be modified while new insights are gained during implementation, the environment changes, or when hypotheses are proven false. More details about LSP can be found in the open-source documentation “The Origins of the LEGO® SERIOUS PLAY® methodology”. LSP was not developed by LeanSP. The article above summarizes common knowledge and is based on personal experience. More details about the origins of LSP and who owns it.